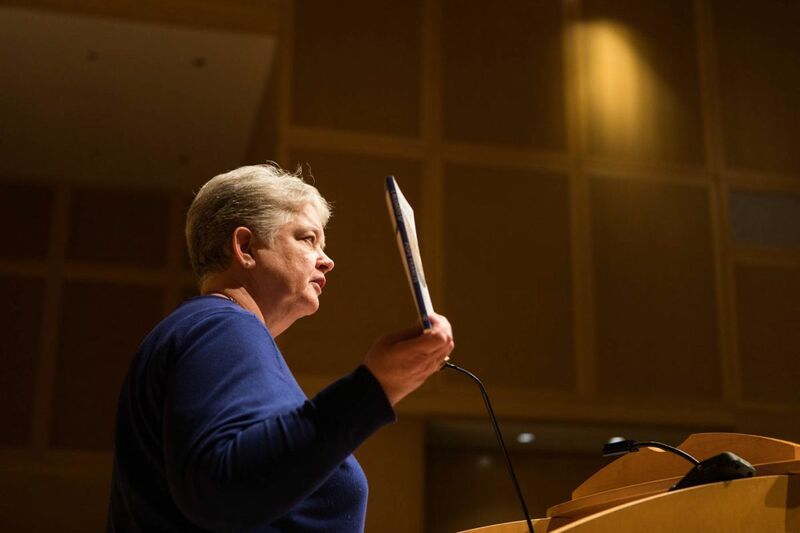 Sister Janet McCann of the Adorers of the Blood of Christ holds up the Pope Francis encyclical “Laudato Si” while addressing attendees at the National Constitution Center on Friday, January 19, 2018. The nuns have filed a religious freedom suit against the federal government and owners of a pipeline on their property. A group of Roman Catholic nuns had a tough time in court Friday morning fighting a gas pipeline buried under their Lancaster County cornfield, so afterward they took their case to a more sympathetic public at the National Constitution Center. Sisters from the Adorers of the Blood of Christ showed a video recounting their situation before about 75 people, then took the stage at an auditorium inside, an hour after another court appearance. "If there's anybody who thinks sisters live quiet, uneventful lives, they have not met the sisters of the Adorers of the Blood of Christ," Sister Janet McCann said, referring to the legal battle the order has waged against the Transcontinental Gas Pipeline Co., known as Transco. McCann and four other speakers described the pipeline as a violation of their religious beliefs, which are infused with environmental concerns, including treating land as sacred and reducing fossil fuel use. One speaker was their attorney, J. Dwight Yoder, who quipped about his appearance Friday morning in court: "This looks like a friendlier crowd." Indeed, the federal appeals panel hearing on Friday featured three judges aggressively questioning his arguments. The panel must decide if U.S. District Court has jurisdiction to consider the merits of a religious freedom case the nuns have filed. The court for the Eastern District of Pennsylvania said it could not. The main issue is whether the nuns should have made religiously based objections during the government process of awarding Transco the right to build the Atlantic Sunrise Pipeline. The pipeline runs from the Marcellus Shale across Pennsylvania, and eventually into Maryland. On the way, it crosses little more than an acre of the Adorers' West Hempfield property. The Federal Energy Regulatory Commission (FERC) approved the pipeline, saying it provides a public benefit. That gave Transco the right to build the pipeline and use eminent domain to take private property after compensation. The nuns made no religious objection during the FERC process. They filed a suit to stop the condemnation of their land, but lost. Then they filed a civil suit under the Religious Freedom Restoration Act. On Friday, the three-judge panel questioned Yoder on why the court should now take up a matter the nuns failed to bring up during the lengthy FERC process. Transco first applied in 2015 to FERC, which approved the pipeline in February 2017. The judges suggested the court would be the proper venue if the nuns had brought up the issue during the FERC process. "Couldn't they have chosen to raise the Religious Freedom Restoration Act with FERC?" Chief Judge D. Brooks Smith asked Yoder. The judge later added, "All they had to do was show up" and object. In addition, an attorney for Transco argued, the nuns also failed to mention their religious arguments in their other civil suit against condemnation. After the nuns lost that suit, Transco quickly set to work burying a 42-inch natural gas pipeline under their cornfield. Yoder argued that the religious freedom act was written by Congress and makes no mention of when or where a religious freedom suit has to be filed. The nuns' religious freedoms were not impacted until the pipeline was being built and buried, he said. The Adorers are an "innocent" third party and not part of the FERC application process, he said. At the Constitution Center, supporters said it did not seem fair that nuns were expected to know the intricacies of FERC proceedings. Duncan Wright of Philadelphia attended court and also was at the Constitution Center to show his support for the nuns. "I think this really has to do with the moral basics," Wright said. He referred to a line from an encyclical on the environment from Pope Francis: "What kind of world do we want to leave behind?" Yoder admitted after his appearance in court that it might be an uphill fight, but he said the nuns have faith on their side. "It's David vs. Goliath," Yoder said. "We have to believe there is a way to get this done." The appeals panel did not say when it would announce its decision.